Where can I get instructions for my artHIVES website? When can I start building my website? As soon as you have completed the registration process an email will be sent to your inbox with your username and password, which will allow you to access your back office and begin the process. 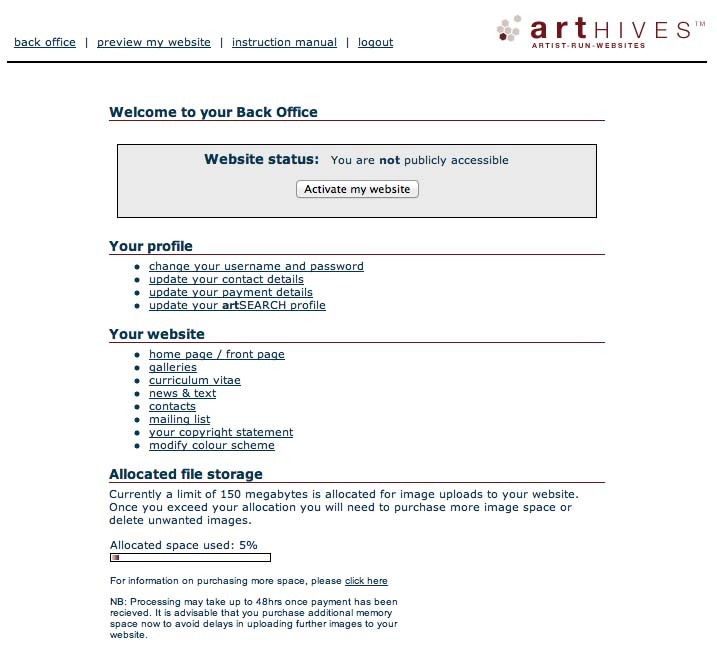 Once you subscribe to artHIVES you are given access to your own back office environment where you can edit all aspects of your website. Your Back Office is just another section of your website that can only be accessed with your username and password. Any editing you do happens instantly while you are online, however there are options to hide some sections of your site from public access while you are making changes or creating new sections. From you back office you will find a link to the Instruction Manual, however the back office uses an intuitive design model with most instructions appearing onscreen. Can I get someone else to build my site for me? I have subscribed to artHIVES, when will I get my login details? Please email if you do not receive your member details. The most likely cause for this is because the .jpeg or .gif file you are uploading contains an incompatible character like a forward slash or a comma. File names should only contain alphanumeric, hyphen or under score characters only. Try changing the file name and uploading again. What will my artHIVES web address be? I already own a domain name, can I use it to direct people to my arthives website? Option 1 - Redirection This option is the simplest to set up. Redirection simply means that if a visitor types your domain name (eg.www. example .com) into a browser, they will then be redirected to your website and then see the arthives URL in the browsers's address bar (eg. www. arthives .com/example). Option 2 - Full Integration This option is a little more complex to setup, however it is also gives a more professional appearance. When a visitor types your domain name (eg. www. example .com) into a browser, your name remains in the browsers's address bar. Additionally all of your sub pages will retain your domain name (eg. www. example .com/galleries , or www. example. com/news). For more information about this option visit the Linking your own domain name with your website. How do I fully integrate my domain name with my website? Use the following steps to fully integrate your domain name with your artHIVES website. You can integrate up to 3 different domain names with your site (eg. www. example .com, www. example .com.au and www. example .net). STEP 1. In your Back Office click the "domain management" link > enter your domain name in the "New Domain" field > click "Add" NB. The following instructions are for domain names registered through the artHIVES domain name service. It is possible to integrate domains registered through other companies, however the process will most likely vary. STEP 2. Login into your domain name Management page > select the domain name you wish to link > Click "Administer"
STEP 3. If Redirection has been setup > Click "Disable Redirector"
STEP 4. Click the "Domain Name" link > In the "Host Name" fields (at the bottom of the page) enter ns1.partnerconsole.net (in the first field), ns2.partnerconsole.net (in the second field), ns3.partnerconsole.net (in the third field) > Click "Update Name Servers. STEP 5. Click "Return to Domain Menu" (at the top of the page) > Click "Zone Manager" NB. If you see a message saying "Zone Manager Not Enabled" please contact us. STEP 6. Click the "A" to Add a new A record > In the "Name" field enter your domain name but do not include the www (eg. example.com) > In the Host field enter 208.77.145.190 > the "ttl" field should already display 3600 > Click "Add Record"
STEP 7. Click the "CNAME" in the "Name" field enter "*" > In the Host field enter park.partnerconsole.net > the "ttl" field should already display 3600 > Click "Add Record"
STEP 8. Click the "CNAME" again, this time in the "Name" field enter "www" > In the Host field enter www. arthives .com > the "ttl" field should already display 3600 > Click "Add Record" STEP 8. Give it some time - you are finished integrating your domain name with your website but it may take up to 72 hours to start working, however we generally find it only takes a few minutes to an hour. I already have a domain name parked at another host, can I still forward it to my artHIVES website? How do I buy or transfer my own domain name? How many images can I upload to my website? How do I increase my Megabyte upload limit for images stored on my website? Once you have used 85% of your allocated space a new link will appear in your back office which you can use to order more memory space. Memory space will not be available until your payment has been processed by artHIVES, so it is recommended that you invest in additional memory when you have used 85 percent of your existing quota. How many news and text articles can I upload to my website? You can create as many news an text articles as you like. How can I increase the chances of my site appearing on search engines? We are quite pleased to know that most artHIVES sites are now appearing on the first page of search results in Google when searching by name. If your site is not there yet there may be a simple reason. Search engines work by searching for key words on your website, in particular your home page. For this reason it is important that the text on your home page contains words which people might use to find your website. Make sure you have your name and include words that describe your art practice and where you work. There are many other factors which influence how your site is found by search engines, but always remember that content is king.